Promotional plate from the Korea Institute of Science and Technology : Promotional plate from the Korea Institute of Science and Technology 을 보여줍니다. The foundation for domestic scientific and technological research was established in 1966 when the Korea Institute of Science and Technology (KIST) was founded as the nation’s first comprehensive scientific research institute. As Korea promoted industrialization in earnest in the 1960s, it was in dire need of the introduction of advanced technologies and expansion of research to improve the technical standards of domestic industries and develop the economy. U.S. President Lyndon B. Johnson promised support for the establishment of a Korean research institute and released a joint statement regarding this issue during a summit between Korea and the United States in 1965. In accordance with this agreement, the Korea Institute of Science and Technology was established as an incorporated foundation in Hongneung, Seoul, on February 10, 1966 and Choi Hyeong-seop was appointed as the first director of the institute. The institute building was completed in 1969 after a three-year construction period. The government supported the KIST through the Act on the Promotion of the Korea Institute of Science and Technology, and President Park Chung-hee paid a contribution of 1 million won to support the scientific and technological research. The state-sponsored KIST attracted top talents from overseas to pioneer the development of domestic science and technologies, and it has significantly contributed to the growth of the heavy industries and technology industry since the 1960s. In 1981, the institute was integrated with the Korea Advanced Institute of Science (KAIS) to form the Korea Advanced Institute of Science and Technology (KAIST). 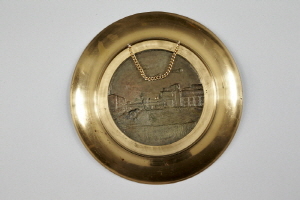 This is a round embossed plate portraying a frontal view of the KIST inside double rims. An inscription of the Korean name of the institute is positioned above the figure of the institute, with its name in English beneath it. There are emblems of the KIST on both sides of the center of the plate. 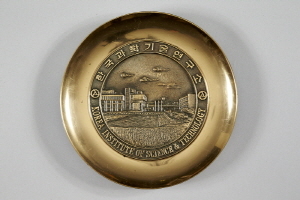 This is a promotional plate from the Korea Institute of Science and Technology, Korea’s first comprehensive scientific research institute established in 1966.